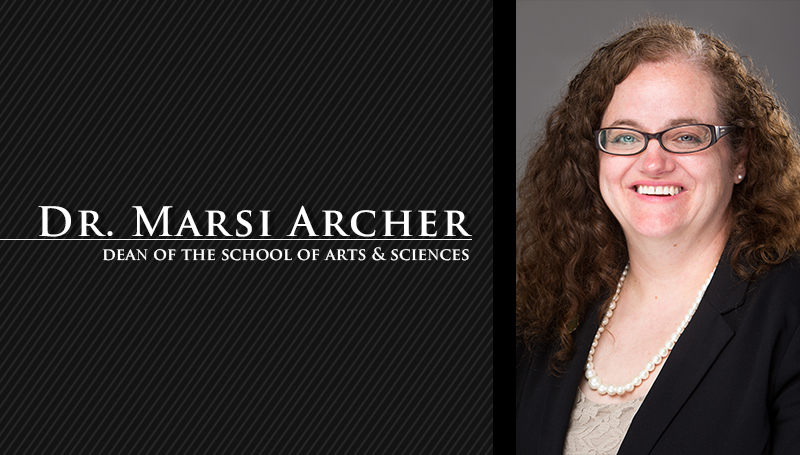 Dr. Marsi Archer has been named the new dean of the School of Arts & Sciences at Missouri Southern State University. She has served as the school’s interim dean since Aug. 1, 2017, and was offered the permanent position following an extensive search process. Archer received her bachelor’s of science in chemistry in 1993 from James Madison University in Harrisonburg, Va. She obtained her Ph.D. in inorganic chemistry from Ohio State University in 1998. She joined the Missouri Southern faculty in 1998 as an assistant professor, reaching associate professor status in 2003 and full professor in 2009. She served as department chair from 2010 until her appointment as interim dean. She is a member of the planning committee for the Yours to Lose – Advanced Medical School Acceptance Program, helping develop curriculum for the pre-med program in conjunction with KCU’s new Joplin medical school, and developing criteria for admission into the program. She also serves as a member of the board of directors for the Missouri Center for Advanced Power and as the faculty athletics representative. Dr. Paula Carson, provost and vice president for academic affairs, said that an extensive external search was conducted before the search committee made its selection. Serving in an interim role for the past year allowed Archer to demonstrate those vital qualities, said Carson. “She built an effective leadership style, the camaraderie and a vision needed to bring this school forward,” she said.